Instead of dividing our community and chasing yesterday's dreams, let's embrace our California heritage and work together to address today's needs. Keep it Strong, "Keep it California""
to secede from California to form a "State of Jefferson"
To prevent this catastrophic outcome, on Tuesday April 7, 2015, concerned citizens from throughout rural California met in Redding, California and voted to form a new multi-county, non-partisan political action committee. Keep It California PAC was formed to represent the interests of all republican, democratic and independent voters who oppose separation from California. Our mission is to advocate for better representation of rural California and to oppose breaking away to form a new state. We are Stronger Together. March 7, 6PM -- the Tuolumne County BOS will hear from KIC and SOJ at the Motherlode Fairgrounds, Sonora. Many different proposals to divide California have been suggested over the years. 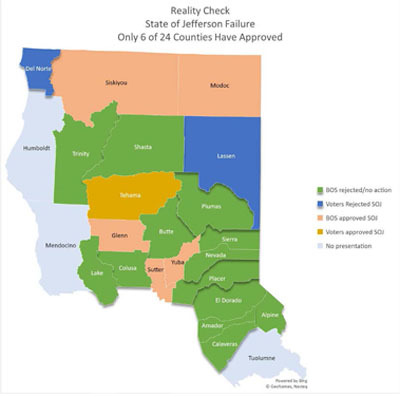 One idea that has been around for a long time would combine portions of southern Oregon with some northern California counties to form a new “State of Jefferson.” Until recently this notion has been nothing more than an expression of regional identity, but now a group of well-funded extremists has started actively promoting the secession of 20 California counties and the formation of a new state. They have been holding "town hall" meetings in the targeted counties, and asking Boards of Supervisors to vote for a "Declaration of Separation," asserting that America's fundamental principle of "one person/one vote" discriminates against rural areas. They also object to California's strong environmental protections, to many other provisions of state law, and to what they call "urban values". Although county supervisors have no power to secede from the state, several Boards have supported the proposed "declaration." Elsewhere, arguments that the Board has no moral right to presume to speak for its people on such a momentous matter without any attempt to ascertain the will of the people have led them to put an advisory vote onto the ballot in 2016. Article 4 of the US Constitution states that forming a new state requires only a simple majority vote by the legislature of the existing state and by Congress. Neither a popular vote nor Presidential agreement is needed. Although this process seems simple, it has not been used since 1820, when Maine split away from Massachusetts. "State of Jefferson" advocates propose that the counties would be the primary unit of government in the new state. They would receive most sales and property tax revenues and each would have its own state senator -- an arrangement that would violate US Supreme Court rulings and also be grossly unfair to the residents of the more populous counties. If proponents can get enough counties to express support for secession, they intend to approach legislators from the rest of California and argue that the departure of the northern counties will save the rest of California’s taxpayers a great deal of money. This argument could persuade legislators of both parties -- and if California approves, the current US Congress might do so too. Only then would a new state constitution be written, and new laws and regulations created. Only then would the people know the financial impacts of the decision -- and by then it would be too late. Secession from California would be disastrous for the region's residents, who receive far more in state services than they pay in taxes. After partition, the new state would continue to be geographically isolated, sparsely populated and economically disadvantaged, lacking the resources to fund public education, social services, highways, parks, or law enforcement to anything approaching an acceptable modern standard. Without the protections provided by California’s landmark environmental laws, the region’s abundant natural resources would soon be gone forever. Without the infrastructure of a modern economy -- no east-west interstate highway or railroad, no deep water port, no significant airport, no major medical center or university, and nothing resembling a metropolitan area, the state's prospects would be most unlikely to get better anytime soon. To make things even worse, the loss of California "branding" would weaken our markets for agricultural products, diminish our appeal for visitors, and harm many other segments of the economy. Real estate values would probably plummet too. The last time a state divided was in 1863, when West Virginia split off. It took 50 years just to straighten out the legal tangles. We can't afford a lawyer's paradise like that here.